Happy August! I can't believe it's already August, this summer is flying by. Today is release day at My Time Made Easy and I've already shown you one template. Do you want to see another one? 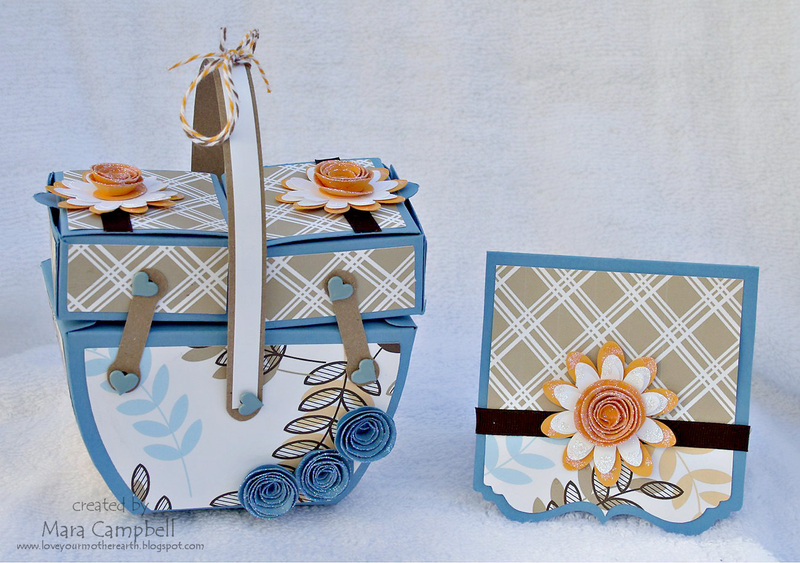 This one is called Grammy's Sewing Kit and it's pretty amazing. 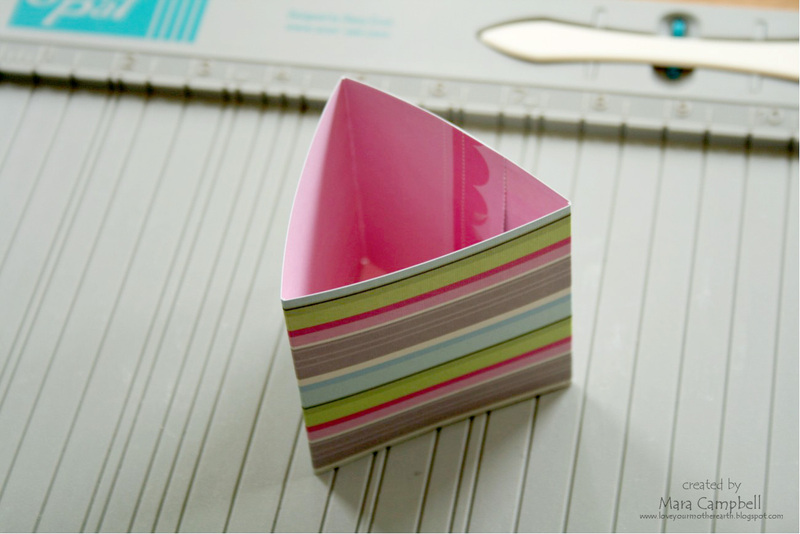 This template is designed to replicate a cantilever sewing box. 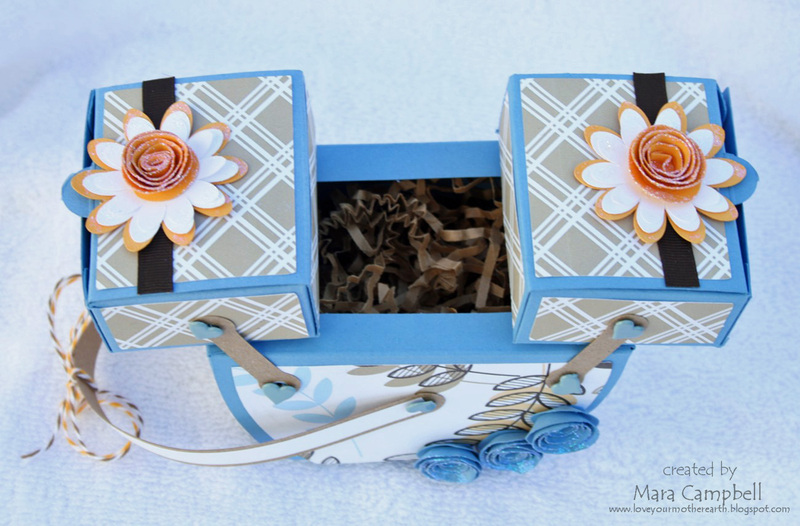 Both boxes up top are on hinges and actually slide aside to reveal the inside of the bottom box. It's a great interactive design. And both boxes up top open as well. There is so much room in this template to hide all sorts of goodies and gifts! 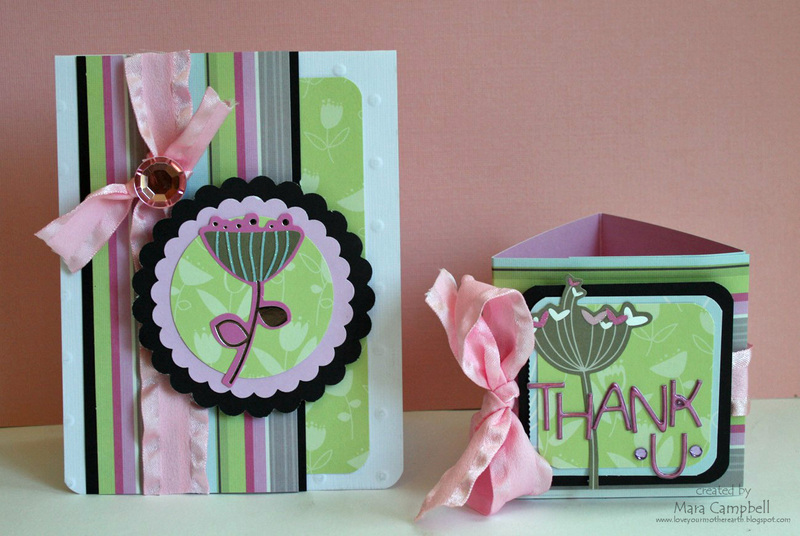 I used the Romance papers to embellish the template along with flowers from the Bloom Builders cut files. 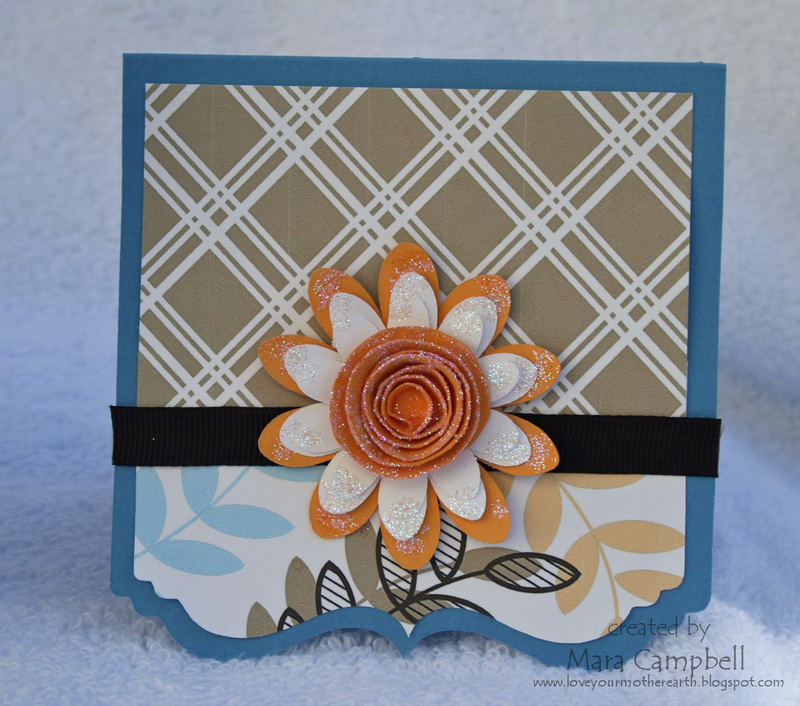 I had great fun getting my glitter out and glittering up all my flowers for this template. I brushed on elmer's white glue with a paintbrush and then sprinkled on the glitter. I used the Creative Cards 2 cut file to create this matching card. 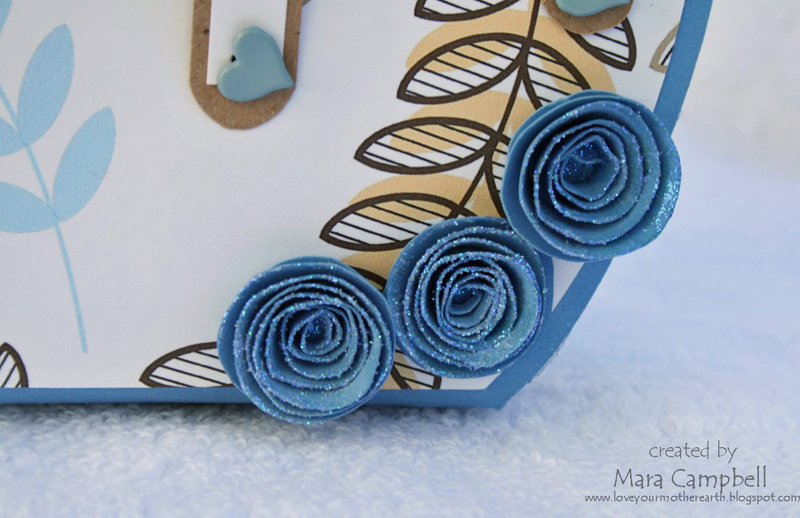 I couldn't resist using my glitter again on the flower! There is much more inspiration to be found today. 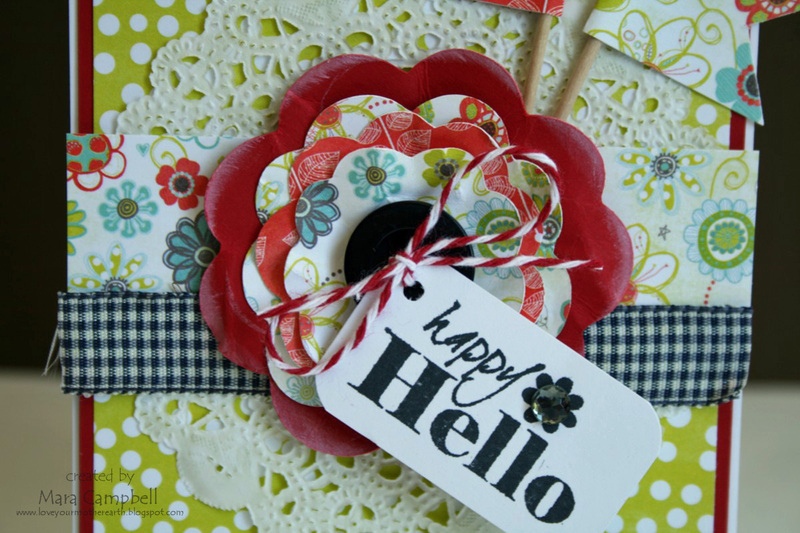 Please check out all the design team blogs, they all have great projects to share today! Hi Everyone! Today is sneak peek day for My Time Made Easy. Lauren has so many fun products coming out this month, I can't wait to share my projects with you. Here is my first one...I used a new template called Slice. My first thought when I saw this template was limes and mojitos! 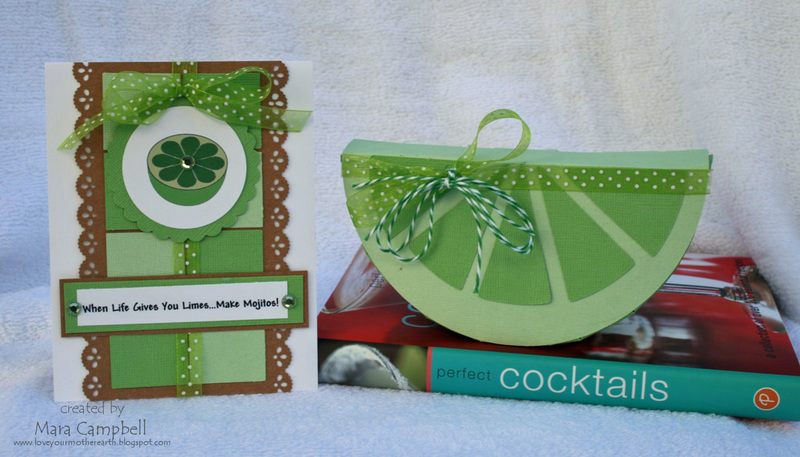 I could not resist putting together a fun gift set using a lime slice and a mojito sentiment on my card. This will be perfect for any number of my girlfriends. 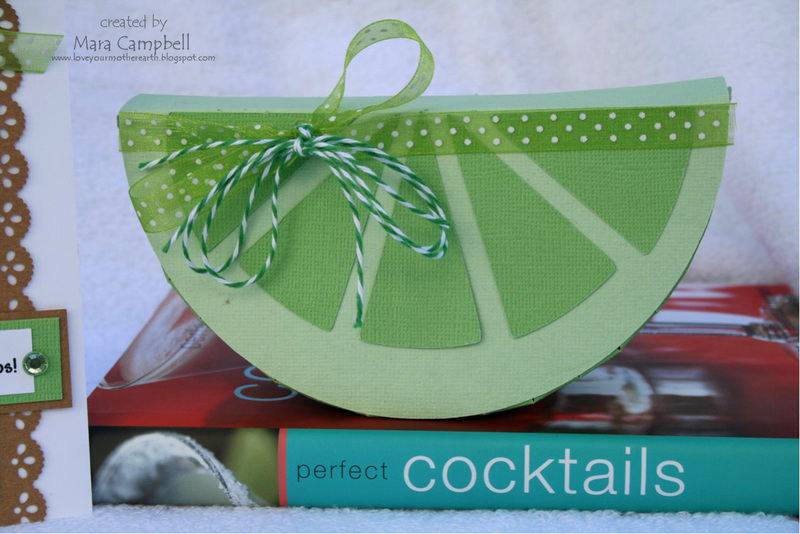 The cool thing about the lime is it opens up. It would be perfect for a wine bar gift card, a restaurant gift card, or a Beverage and More (our local wine and spirits store) gift card. Tooty Fruity is a new stamp set coming out this month. 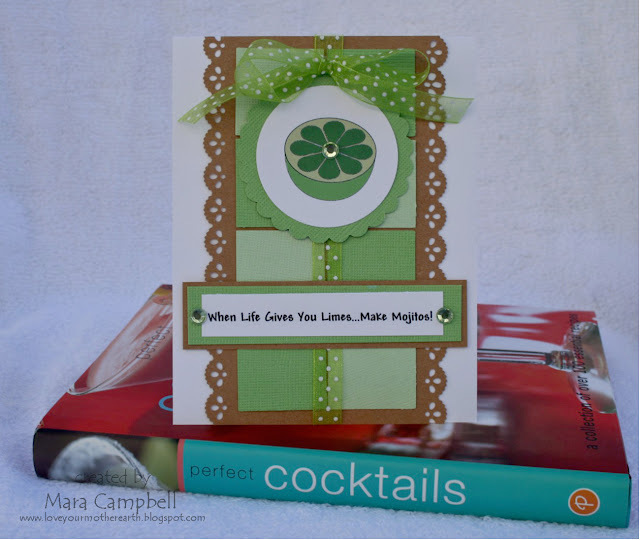 I used the GIMP software and the new stamp set to create this lime for my card. I created the sentiment in word and printed it on white cardstock. I can't wait to decide which friend is going to get this lime gift set. Hopefully the one who will take me along to Happy Hour! Thanks for stopping by today. Please come back all week...I have plenty more goodies to share! Happy Weekend! I hope you are having beautiful weather and enjoying your weekend. We have been watching the Olympics and it's been really fun. I was able to squeeze in a challenge this weekend. 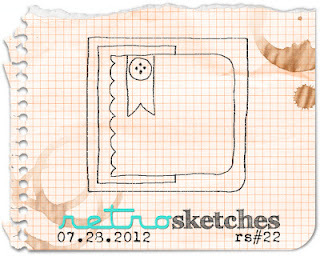 The Retro Sketches #22 challenge to be exact. 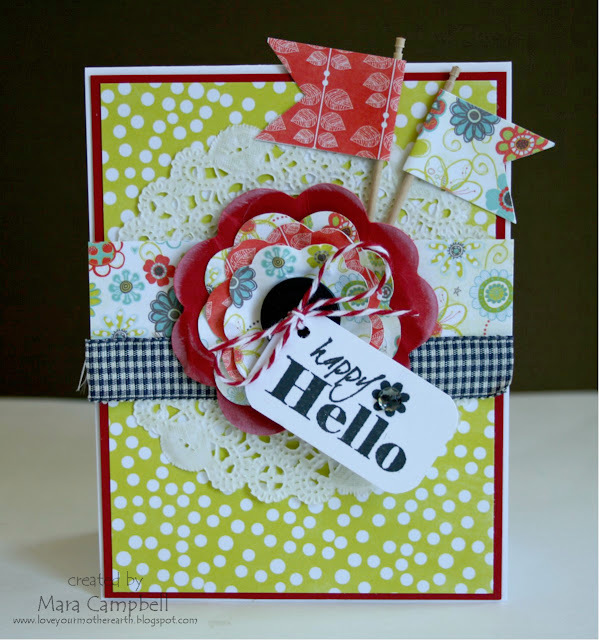 And here is my card. 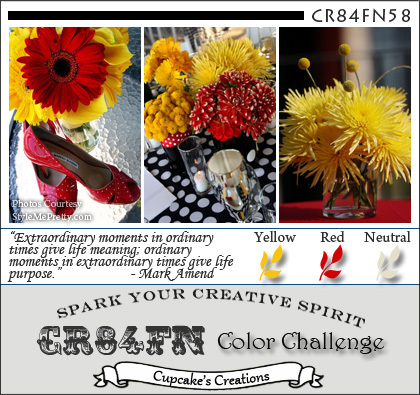 I created a bright birthday card! 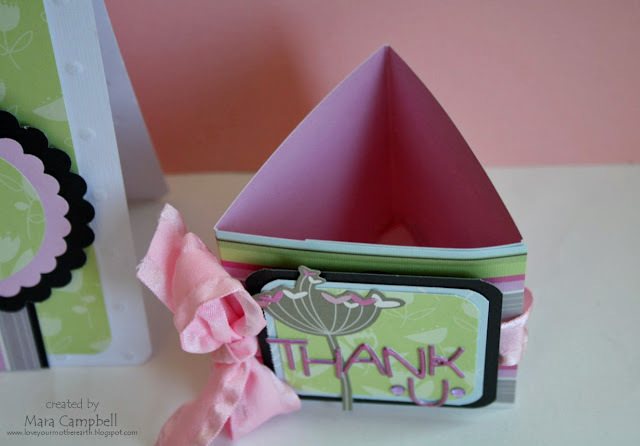 These are some of my favorite papers from Momenta, the Kaleidoscope paper pack. 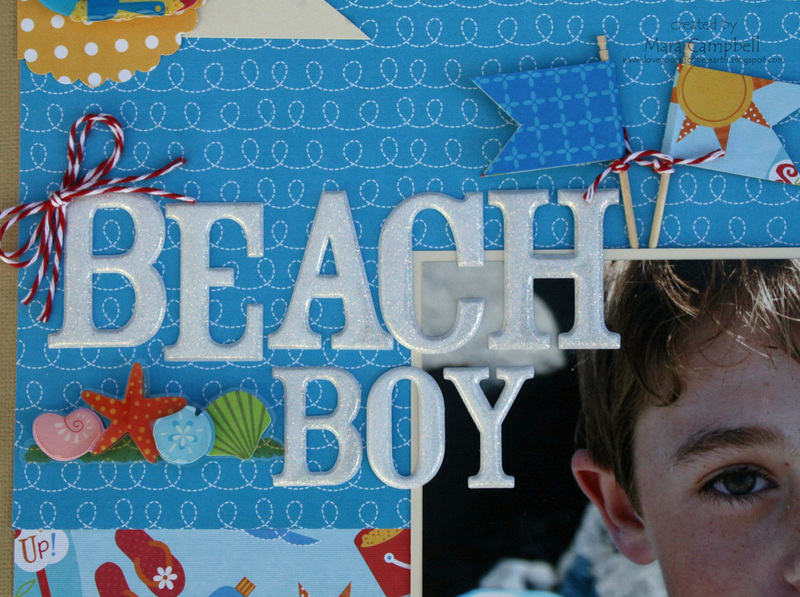 I also added a Momenta clear layered sticker for the focal point. I love their layered stickers. That's all I have today! Are you watching the Olympics? What are your favorite sports? I am partial to the swimming since I was a swimmer all through college. I also love watching beach volleyball, gymnastics, track and field...actually, I will watch anything. I love the Olympics! 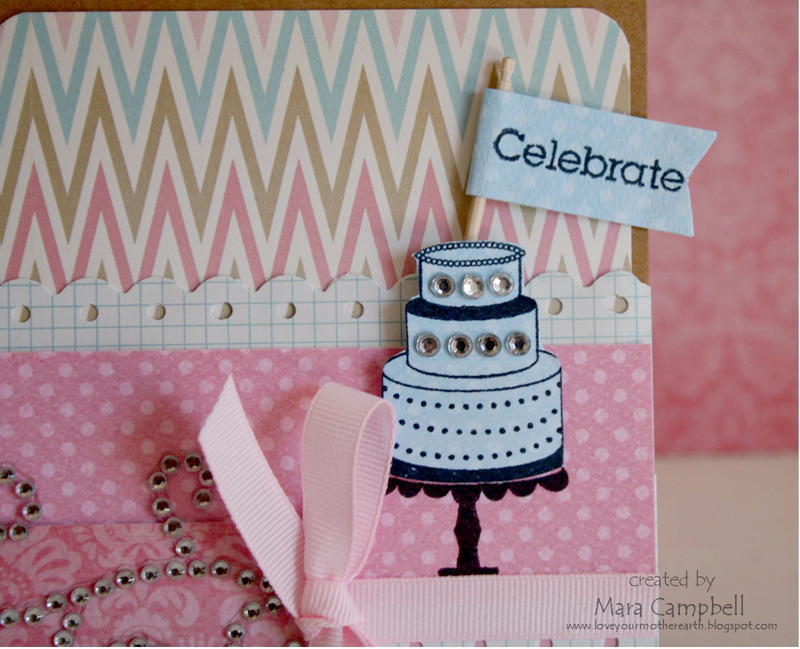 I am using paper from Momenta's Chloe's Garden Pyramid Paper pack and matching letters and embellishments. 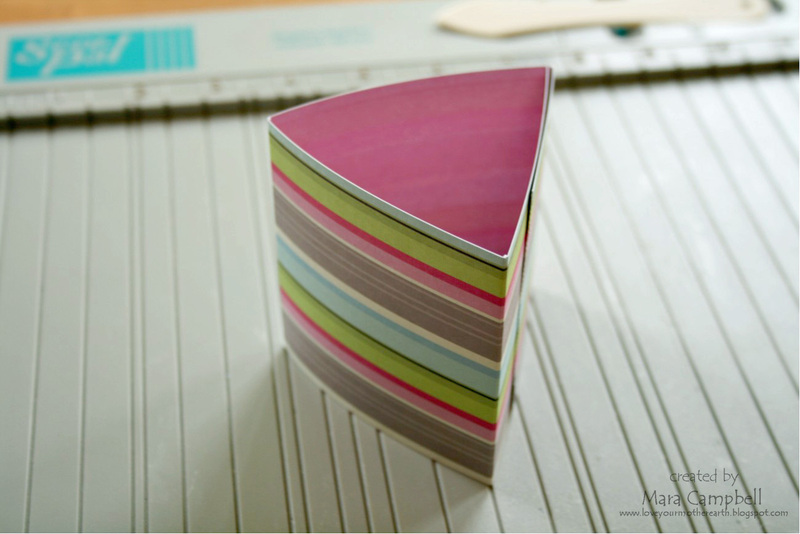 Score your 3 inch x 11 inch paper at 3 inches, 6 inches and 9 inches. Fold the paper on the score lines to create a triangle. At this point, do NOT glue anything together! 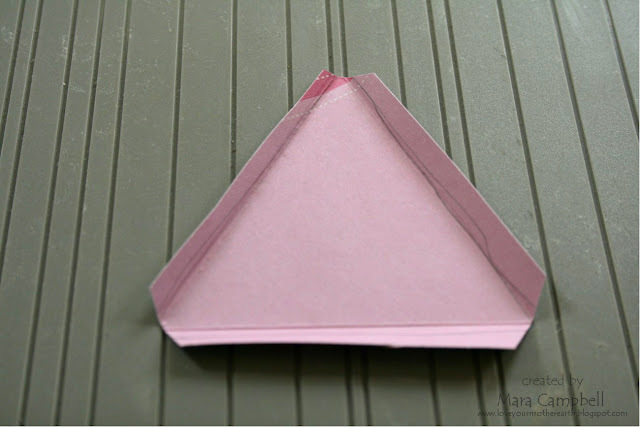 Keeping this triangle together, place it on top of the scrap paper. 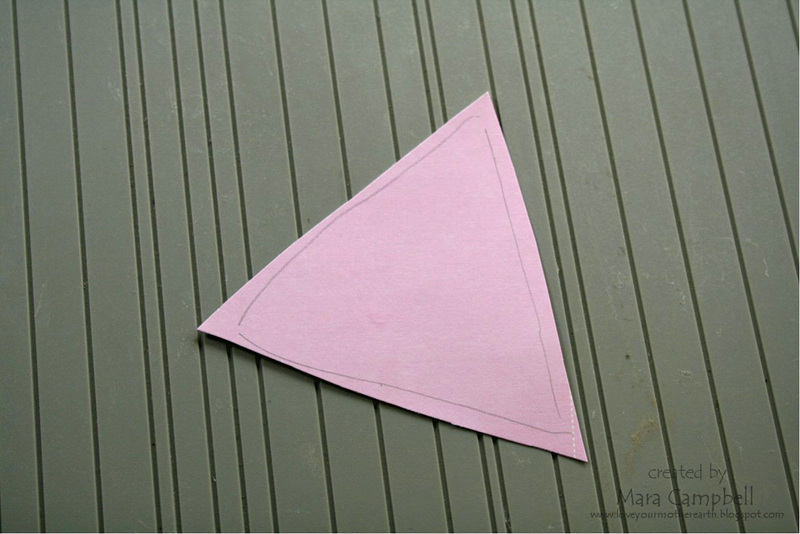 Trace the base of the triangle on the scrap paper. Roughly cut out the traced triangle. 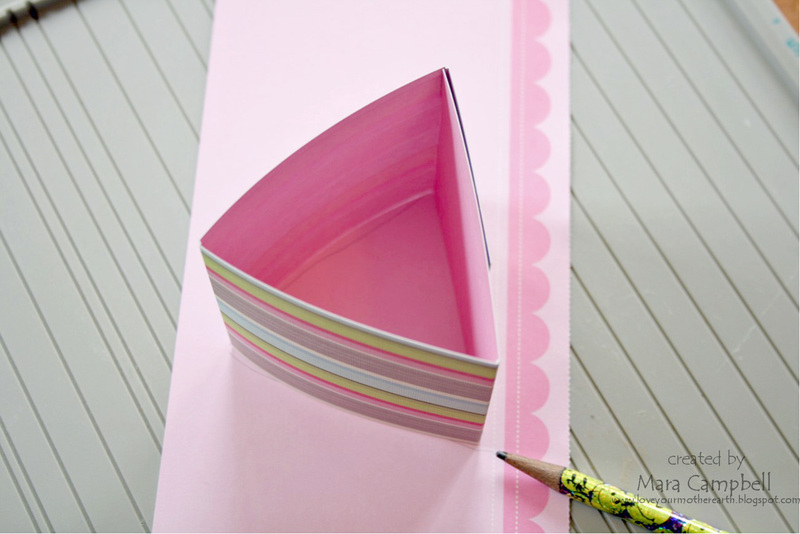 Leave a small border of extra paper around the traced pencil lines. This does not have to be perfect! Score on the traced pencil lines as closely as you can. 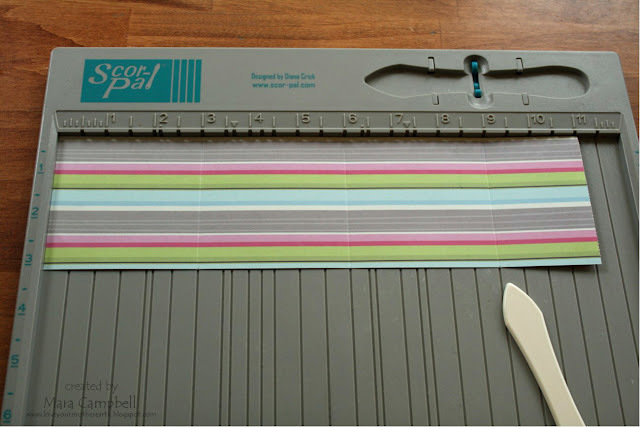 After scoring, cut off the tips of the end of the scored line with scissors. 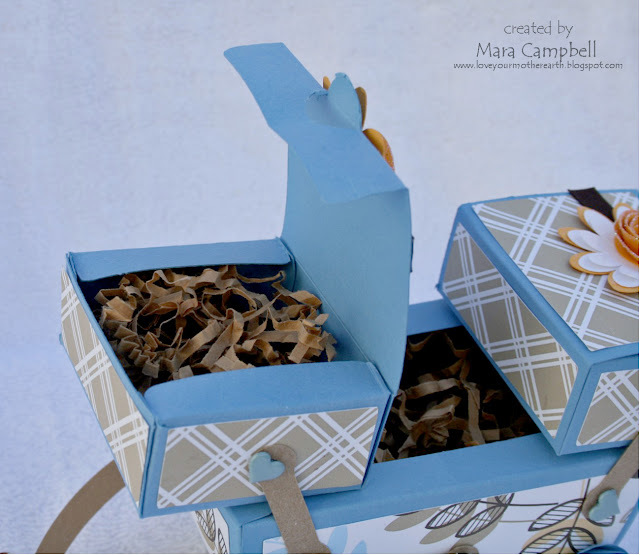 Your triangle treat box is complete! Embellish the outside as you wish!! I used Shimmer and Shine stickers and Annabelle Puffy alphabet stickers to create my outer panel. 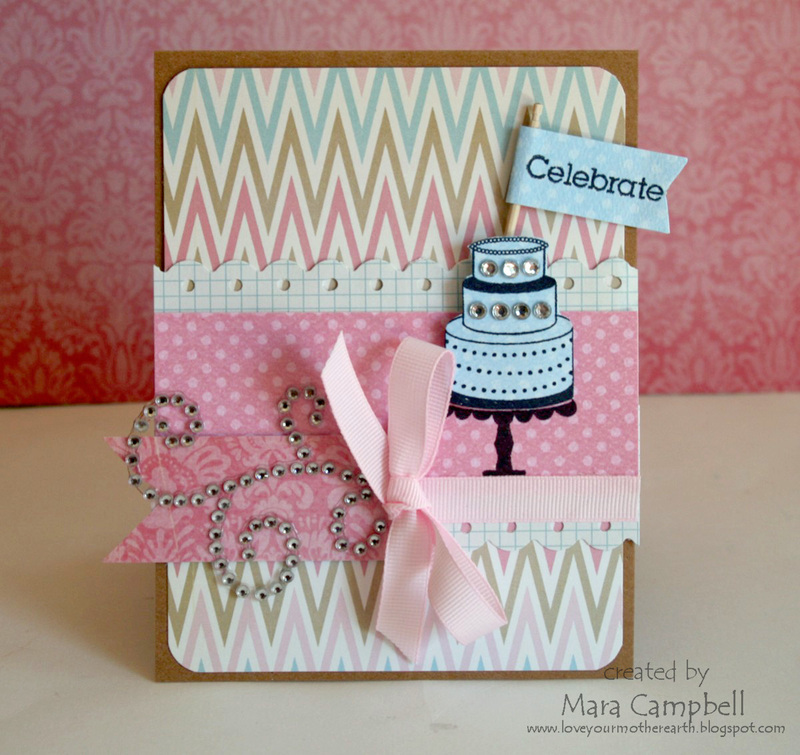 I used the same materials to create a matching card. Every pretty treat box deserves a matching card!! Here is a top view of the box. You could easily add some chocolate treats or a small candle dressed up in a cellophane bag or even a gift card! Isn't that fun? It's a great alternative to a square box. I hope you have something fun planned for this weekend. We have my niece and SIL visiting this weekend, my kids are very excited to play with their cousin!! When I scrapbook, I try to clean up after myself. 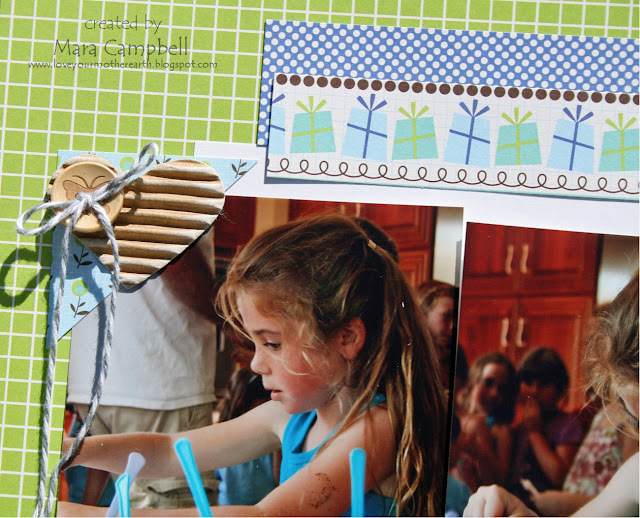 I do have my own little spot to scrapbook, but it's little. And the scraps get out of hand quickly. If I clean up between projects, it saves me some time and sanity. 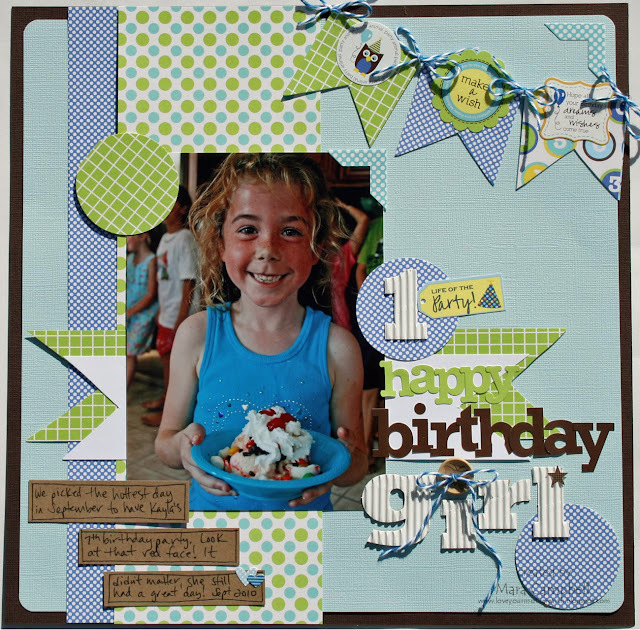 But when I created the birthday layout in the previous post, I didn't bother to clean up. So the next time I sat down I was staring at some Jillibean Soup papers and some more birthday photos. So I created this! My daughter's birthday is in September and we usually don't have to worry about the heat. But her party happen to fall on the hottest day of the month. It was SO hot and we had a bouncy house in the backyard that pretty much baked all the kids. That is why her face is so red!! Despite the heat, she was very excited about her ice cream sundae. I love all the different Jillibean alphabet fonts! And a birthday banner for the birthday girl. And after creating this, I actually did clean up my mess. 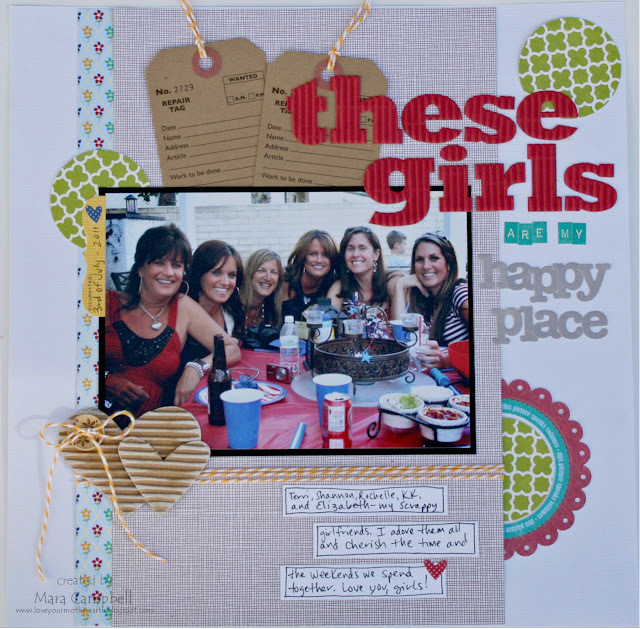 So you probably won't see too many more birthday layouts for a while! I hope your week is going well, thanks for stopping by today! At first I was a bit stumped with all the squares and places for photos. So I decided to just go with 3 photos and try to keep my layout horizontally interesting. I'm not even sure that makes sense, but here's my layout. 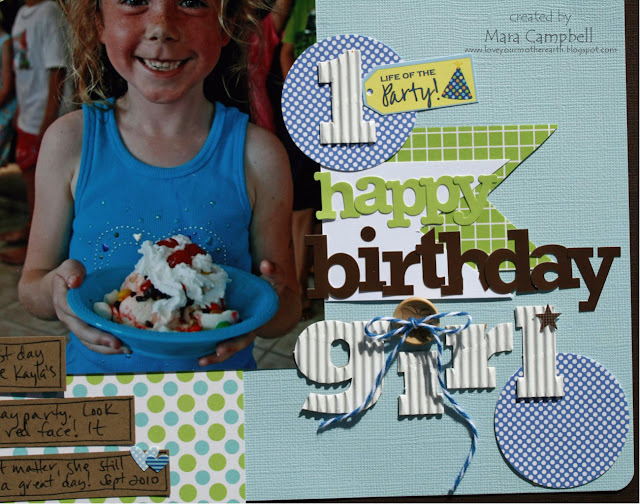 I used some Spotted Owl Soup paper to create this birthday layout for my daughter. 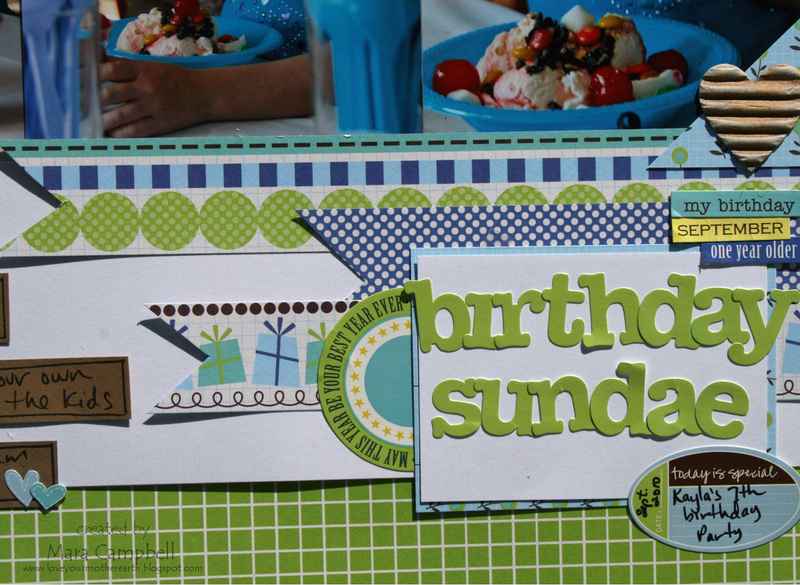 She had an ice cream sundae bar at her last big party and it was fun watching all the kids dive into all the toppings and whipped cream. I added lots of horizontal strips and bits. I love this fun bright green color! 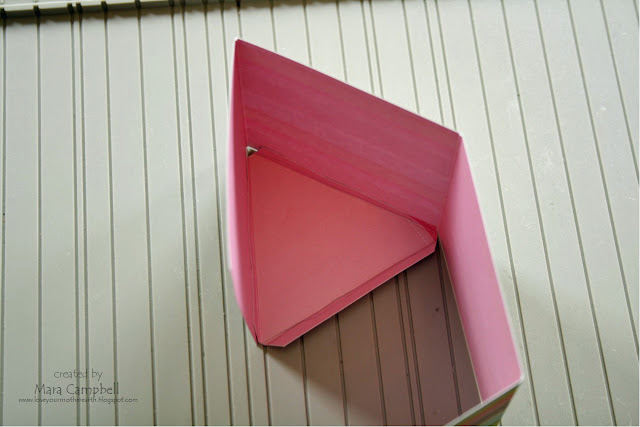 I've been loving all the corrugated shapes lately. 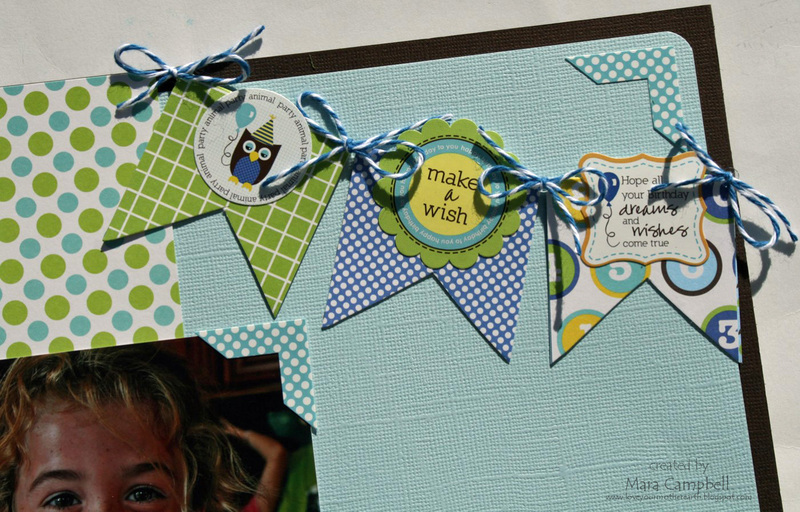 I seen to be reaching for them everytime I sit down at my craft table. This sketch was definitely a challenge for me. But i'm happy to have some of these birthday photos scrapped and IN the family album. Yeah for progress! The paper is from Pink Paislee and it's called Snow Day. 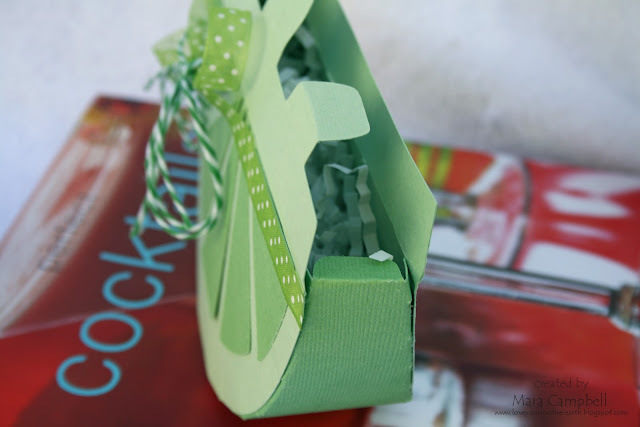 Can you believe it's holiday paper?? 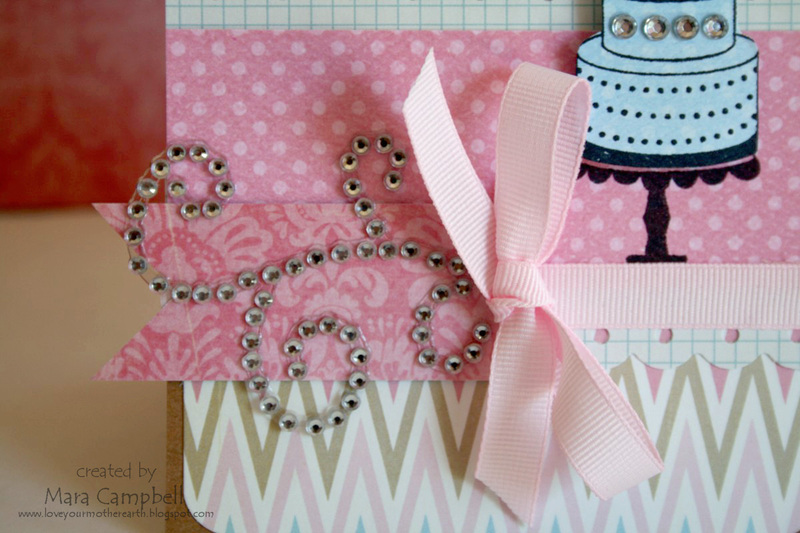 I love the addition of pink to holiday papers but I think it works for a birthday card as well. Isn't this triple decker cake the cutest? It's from my newest Avocado Arts stamp set. 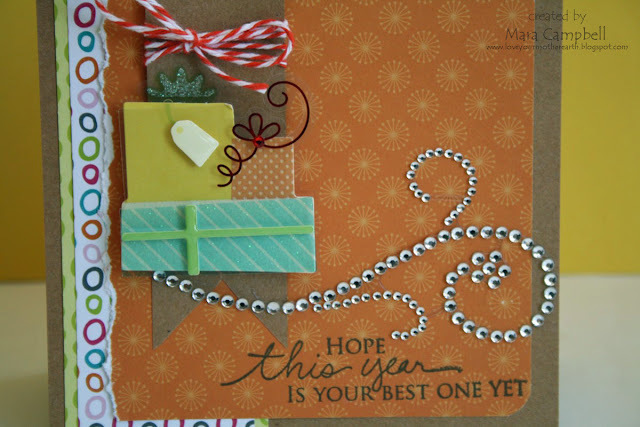 And some bling to add some...well...bling to the card! I hope you had a great week and Happy Weekend!!!! 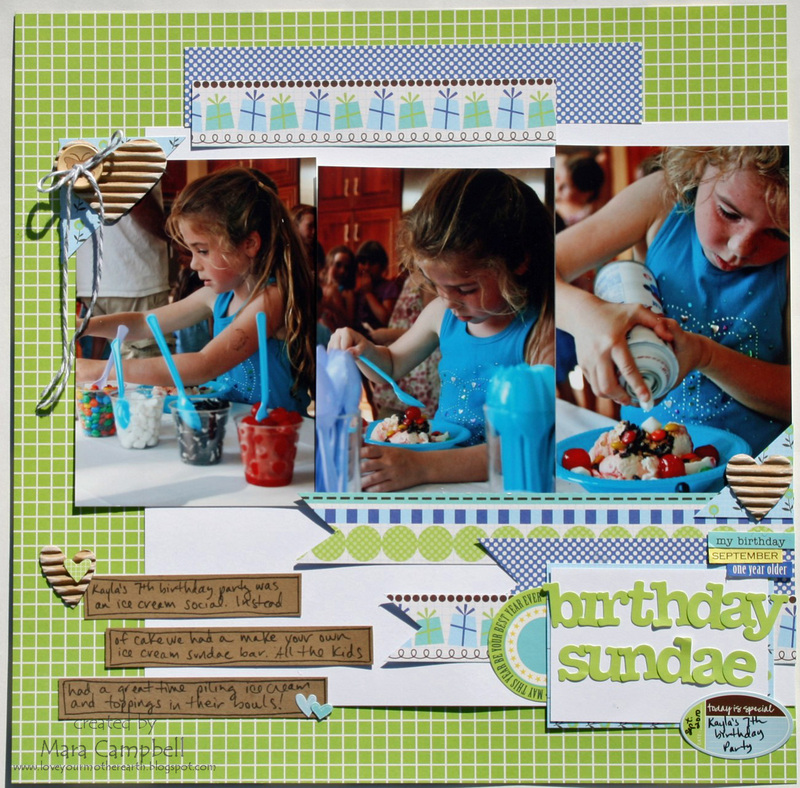 Well, look at this...another layout!! 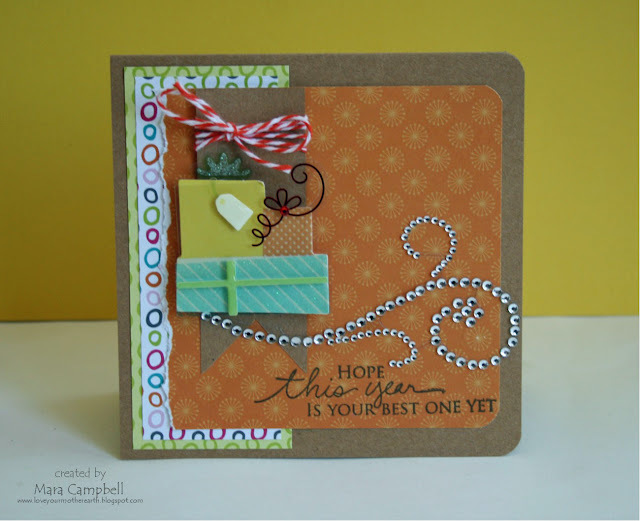 This one I made for the Momenta blog and includes two of my favorite things. 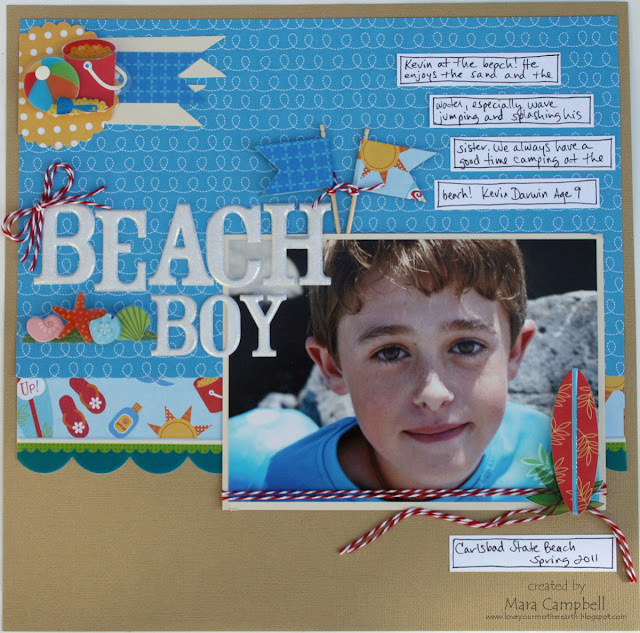 The beach and my boy. Momenta has so many different alphabet stickers and I love them all. These are the white puffy glitter alphas. I also love their 3-D clear layered stickers. There is lots of love going on here. I think my favorite sticker is this fun surfboard. Surf's up, dude! Happy Monday!! And no, Monday is not my happy place. I took a break from creating layouts for a couple of months because I was feeling really burned out. 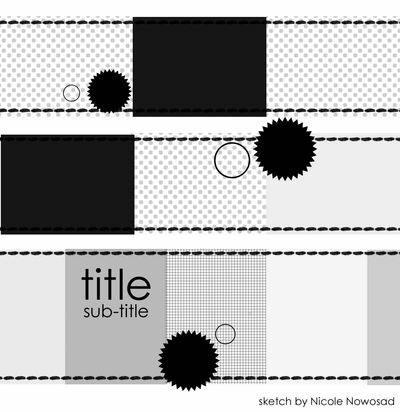 I made a few here and there but it was a huge change from creating a tons of layouts every month. I feel like my layout mojo is coming back. 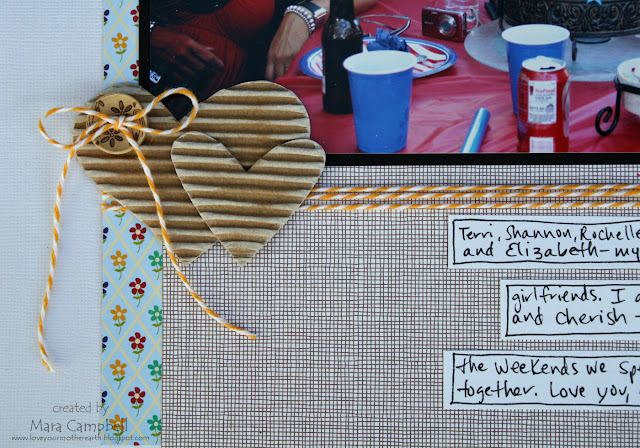 When I sit down to scrap, I think about layouts and actually want to attempt one. This past week I did just that...actually created a layout. 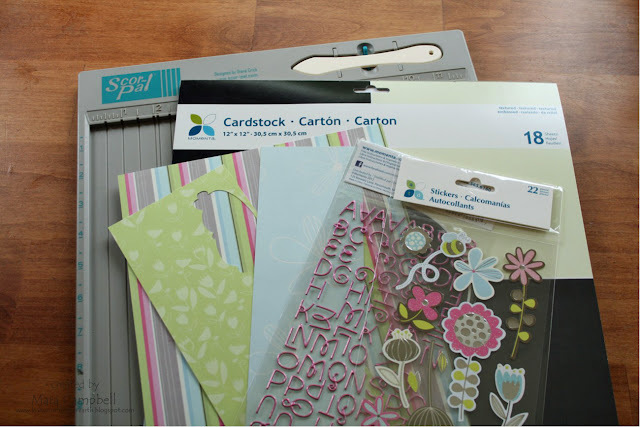 I used to be 'caught up' with scrapbooking. That means that I had scrapped all my photos up to about 1 month ago. Well, I am now way behind on my scrapbooking. Like an entire year!! The horror! All kidding aside, that's fine with me. I'm not so obsessed with keeping up. I have just been grabbing photos that catch my eye. This is one of my favorite photos with some of my favorite girls. 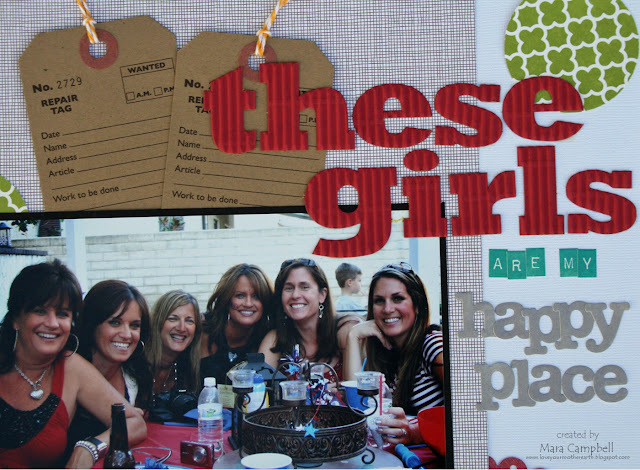 These are my scrapbooking buddies and I love them all dearly. I used lots of Jillibean Soup on this layout. I went a little Jillibean Soup crazy. Have you see their wood buttons? They are super cute! And I love to mix and match their alphabet fonts. It was fun and relaxing to create a layout using a photo that I love and goodies that I love. I really think I will be sharing many more layouts in the future! 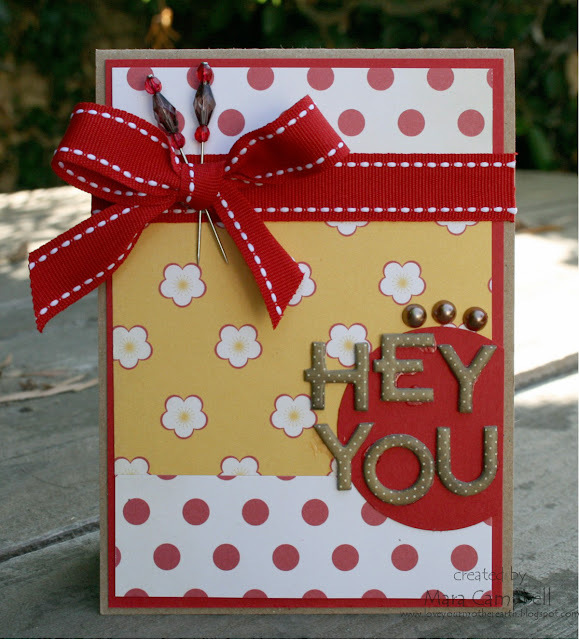 I hope you all had a wonderful weekend...thanks for stopping by! Happy Friday!! I had a chance to play along with the CR84FN color challenge this week. I loved the color combo! My mind immediately went to some Cosmo Cricket papers I have been saving. Actually, I have been saving the scraps. There are some papers that I love so much I can't throw away one single scrap. And the Homegrown Garden line from Cosmo Cricket falls into that category. 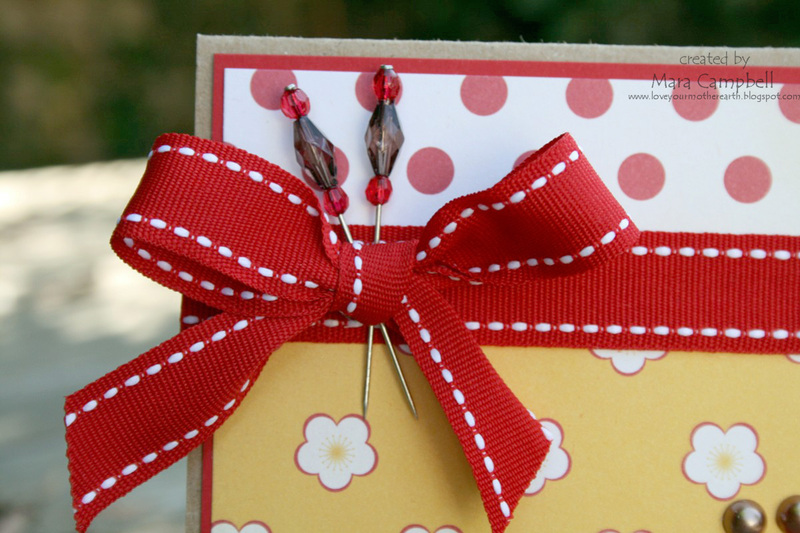 I still love that polka dotted paper. I added a bow and some fun stickpins from Jillibean Soup, along with some long forgotten letters I found in my stash. That's it for me today. Do you have big plans for the weekend? We will be headed out to Dodger Stadium to see our boys in blue play and I hope the weather is nice for the game. Thanks for stopping by today, friends!! Summertime means certain things around here...pool time, going to the beach, fruity cocktails, fresh strawberries, tomatoes from the garden, and watermelon. 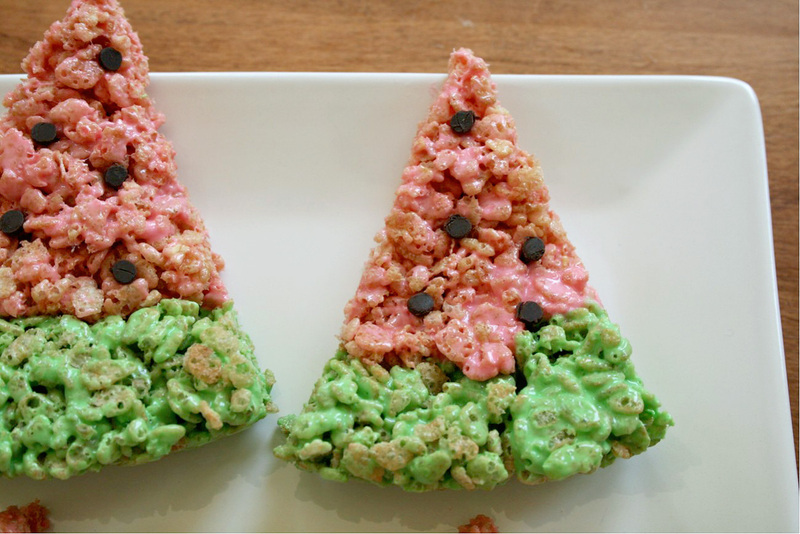 We love watermelon around here, it's a fruit we all can agree on. A few weeks ago I ran across a different kind of watermelon and just had to try it. 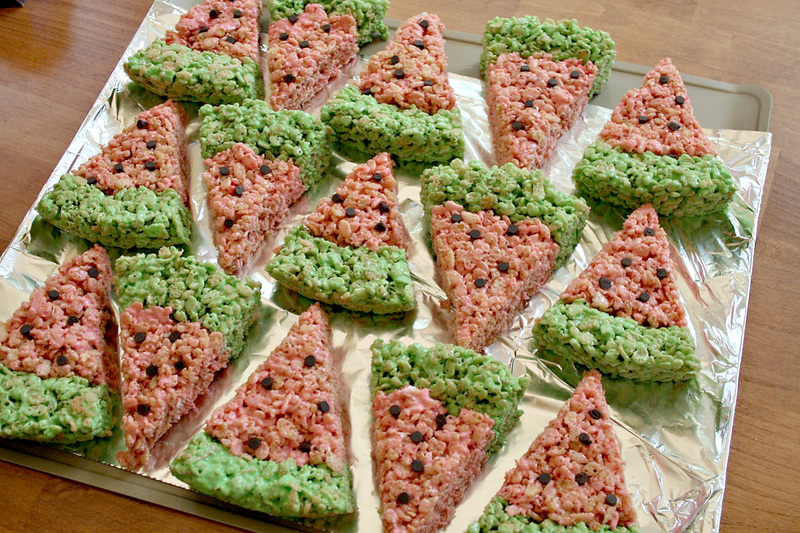 Watermelon rice krispy treats...aren't these the cutest ever??!! 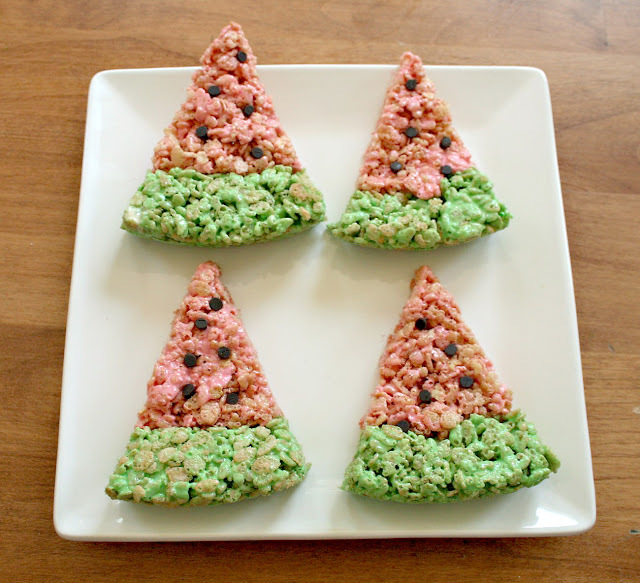 I found this idea at the Glorious Treats food blog and knew I had to make it. You make two separate batches and tint one red/pink and one green (please see her blog post for exact measurements). 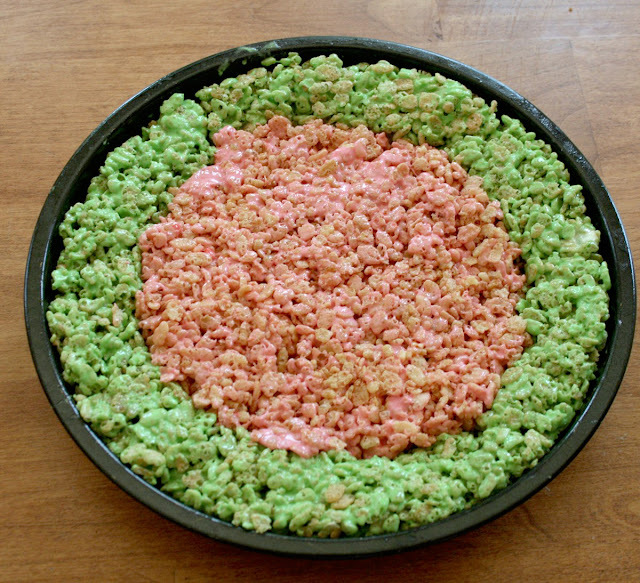 Using a round cake pan, make one ring of green for the rind. Then press the batch of pink rice krispies into the middle of the ring to create the watermelon look. I used mini chocolate chips for the seeds (only because I couldn't find the chocolate covered sunflower seeds she suggests using...where do you find those things???). I lined them all up on a cookie sheet to take with me to a summer party. They were a big hit! Please go to the Glorious Treats blog for the official recipe: Watermelon Krispy Treats. But be prepared...She has so many great baking ideas, you might end up getting lost in her blog for a while. Thanks for stopping by today! 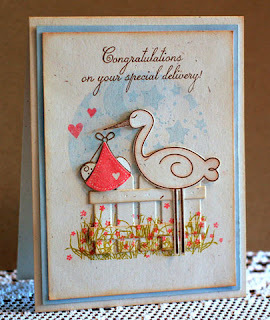 I again used my Alora paper pack by Bo Bunny. The layered flower I cut using my Cricut and the sentiment is Unity. The flags were a last minute addition and to be honest, I'm not really feeling them. I think I will probably end up taking them off when I go to send the card so it will actually fit inside the envelope. But for now, they are flying high!! Year In Review: Red White and Blue! 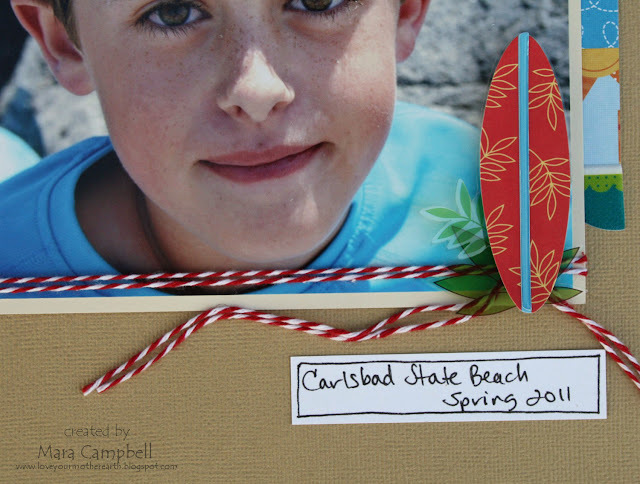 My Time Made Easy: Birthday Bash!